Napoleon achieved reconciliation with the Catholic Church. France had been divided since 1789, when the National Assembly put the church under state control. The Pope had lost the right to appoint priests and bishops in France. Church lands had been confiscated. Who was now the rightful owner? The Church in Rome claimed to be. This caused great instability and Napoleon was determined to end the discord. In 1801 he signed an agreement with Pope Pius VII reestablishing the Church in France.. It was The Concordat of 1801. But it was under Napoleon's terms. The Church agreed to give up their claim to the lost lands. The principle of religious freedom which the revolution had guaranteed remained in effect. The government would continue to select the bishops, but would submit them to the Pope for his approval. Bishops would appoint only priests acceptable to the government. 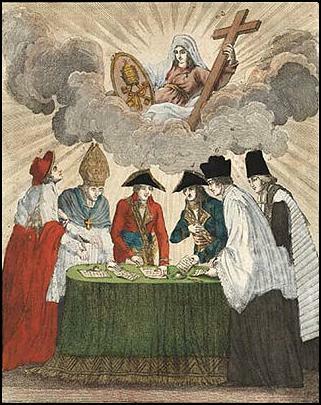 In return Napoleon graciously recognized the Catholic Church as the religion of the great majority of Frenchmen. The Church had lost much, but the dispute was over.